The carbon fibre roof panel for the new Roding sports car. Chomarat’s C-Ply fabrics using Zoltek’s low-cost, large-tow carbon fibre. 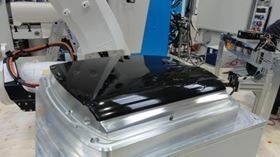 During the recent K showt, Krauss Maffei demonstrated, in real-time, the Surface RTM manufacturing process, by producing carbon fibre roof panels for the new Roding sports car, on the company’s stand five times per day. Zoltek adds that the Surface RTM process uses Panex® 35 carbon fibre and a polyurethane resin system. This is then overmoulded with a polyurethane paint coating, resulting in a premium and paintable surface quality composite part - directly out of the mould. This new production process attracted a lot of attention from OEMs and Tier 1s. The Surface RTM process is the result of a year-long, industrial partnership featuring Krauss Maffei RTM technology, Henkel PU chemistry, Chomarat C-Ply fabrics, Ruhl PU coatings and Zoltek’s specially sized Panex 35 50K carbon fibre. The new process begins with a carbon fibre fabric matrix produced by Chomarat, which is injected with a PU resin (Henkel Loctite Max 2). Once cured, the mould is opened slightly to allow the PU overmoulding material to be injected (Ruhl). The part is then cured again. (Total time from ‘tool closure’ to ‘tool open’ is less than 6 minutes). The part is then removed from the tool, power washed and supplied to the painter – who applies a top and clear coat. A carbon fiber/epoxy molding compound from Hexcel has been used in a new overmolding process to produce a hybrid structure.